Allergic to Kitty? Don’t Panic! It’s an all-too-common scenario. A cat lover meets the man of her dreams. But he’s allergic to her kitty. A choice must be made between the two, and often the cat ends up losing his home. It doesn’t have to be like that. Just ask Holly Tse of California. For her and her husband Zunaid, love – and persistence – conquered all, including his allergy to her cat Furball. Zunaid’s reaction to Furball when they started dating several years ago was immediate, with the characteristic itchy eyes, wheezing and cough. Their early dates took place outside Holly’s apartment, but when the relationship turned serious,giving up Furball was not an option. The couple moved into a bright, spacious townhouse,where Zunaid attempted without a lot of success to control his allergies using various conventional methods, including air purifiers and allergy medication. What finally worked for him was a combination of alternative modalities: specially prescribed Chinese herbs, acupuncture to strengthen his “lung qi”, and meditation (which he had used for a previous medical condition). Holly, who practices Chinese reflexology, also showed Zunaid energy meridians in his feet that were related to allergies; massaging them gave him effective relief. Nix the allergies and keep the cat! It takes commitment to overcome allergies to a cat, as Zunaid and Holly can attest, but with patience and persistence, it can be done. Start with your environment. Use air purifiers. Special machines are available with HEPA filters, just for pet allergies.Designate cat-free zones, particularly your bedroom. Get a made-for-pets vacuum with a HEPA filter and steam cleaner. If possible, replace carpeting with hard surfaces. Use throws on the furniture that can be easily laundered. Feeding your cat a quality diet that keeps his coat and skin healthy and minimizes dander and shedding can help reduce an allergic response in people. Brush the kitty regularly to get rid of old protein-laden fur. Better yet, acclimatize her to the occasional bath. Physicians are quick to prescribe medications that may have side effects. Either that, or they’ll just tell you to give up your cat. Some may suggest a course of immunotherapy injections. A more natural approach would be to consult with a holistic physician or naturopath, who can recommend homeopathic remedies such as allium cepa, euphrasia, natrum muriaticum and nux vomica, or herbal remedies like quercetin, borage, elder or ginseng. Use common sense when petting your cat. Do not touch your face and eyes and wash your hands thoroughly after petting. Switching to a low-dust litter may help both the allergy sufferer and the cat. Using a multi-pronged holistic approach worked wonders for Zunaid. One day, he realized he was symptom-free – and he has stayed that way for three years. An allergy to cats is primarily caused by the protein Fel d 1 found in the saliva, dander and urine of the feline. Several other minor proteins also come into play. Is there such a thing as a non-allergenic cat? It’s frequently cited that female cats, castrated males, and those with darker coats produce less Fed d 1, the protein that causes allergies in people. Breeds such as the Siberian, Sphynx, Balinese, Devon or Cornish Rex are believed to be low allergenic. However, do not adopt a cat on this basis alone if you suspect you may be allergic. Try spending some time with a cat in a shelter or at a friend’s house before making a final decision to adopt. Remember that adopting a cat is a lifetime commitment. Sally E. Bahner is an award-winning writer, columnist, and editor who has spent more than 15 years specializing in cat-related issues, specifically nutrition, holistic care and multiple cat behaviors. More recently she has offered services as a feline behavior and care consultant. She is a regular contributor to Feline Wellness and the Branford Eagle, a local online newspaper. She often gives presentations and classes on cat care. She resides in Connecticut, with her three cats, Pulitzer, Mollie, and Russian Blue Tekla, and husband, Paul, who is amazingly tolerant of her feline obsession. Sally shares her wealth of knowledge about cats at Exclusively Cats. Photo of George by Robin Olson, used with permission. George is available for adoption from Kitten Associates in Connecticut. 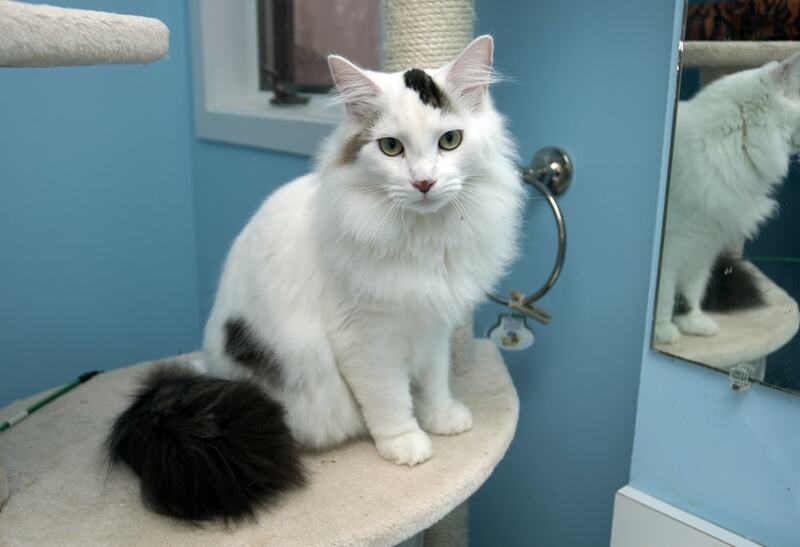 Please visit his Petfinder page for more information about this gorgeous boy. Can Cats Be Allergic to Litter? 14 Comments on Allergic to Kitty? Don’t Panic! Thanks for posting this, Ingrid. What great news for people who are allergic to cats! I’m not allergic to cats myself, but I’m allergic to mold and dust and agree that changing diet really helps (in my case eliminating dairy). I also take quercetin on a regular basis and my allergies are SO much improved. I’d so much rather do things naturally then take drugs that mask symptoms and have horrible side effects. I hope this information gets out there and people try the things mentioned in this article before surrendering their cat to a shelter due to allergies. Also, that is one gorgeous kitty that’s featured in the photo! Is that Sally Bahner’s cat? Why would you minimize the importance of immunotherapy in an article about being allergic to cats? It’s probably the No. 1 way to help people who love cats and have allergies. I had many years of immunotherapy for cats as well as trees — and I have four longhaired cats — and I can tell you it works. Scientists understand what causes allergic reactions and there are targeted, proven ways to prevent the side effects — immunotherapy, and certain medications, including nasal sprays and the newer types of antihistamines that do not cause drowsiness. Others have found that giving their cats “baths” in plain water can reduce dander significantly, and this doesn’t need to be done often. People with cat allergies should stop worrying about their diets or their “chi” — they’ll get better with a course of shots that will eventually desensitize them to the allergen. I don’t think Sally is minimizing immunotherapy, she’s simply suggesting other, more holistic approaches. I think it’s a personal choice as to what people try, and it’s good to know there are so many options. I’m guessing that the number one reason it helps so many people is because it’s what is recommended by conventional physicians. I’m glad it works for you, Lauren. The publication was indeed looking for more holistic approaches. These can be used in conjunction with conventional therapies. Just considering all options! I’m an Asthmatic with an allergy to cats but I wouldn’t ever even consider getting rid of our Montana. I see a great Allergist regularly and undergo immunotherapy as well as take medications prescribed by my doctor. We also use a natural corn dust free cat litter and it works well for all of us. There has never or will never be a question of us getting rid of our beloved child! I’m glad everything you’re doing is working for you, Joanne. I would never give up my cats for anyone. My son is allergic to animals and his allergist said they don’t ask people to get rid of their pets anymore. He said that if the cats didn’t sleep on his bed there shouldn’t be a problem. My son keeps his door closed and has never had a problem because of the cats. If anything, the environment outdoors causes more allergy attacks then the cats ever did. I will always try to find a way around having to give up my animals. They are my family too. I wouldn’t even move into an apartment that wouldn’t let me keep my pets. When I was married my ex was controlling and thought he was the king. He told me once that he wanted me to get rid of my pets, especially my cat. Well, my animals were there before him and I told him he would go before my pets and he did. It was my apartment and he moved in, so I ended up having him evicted from my apartment with a court order. I’ve heard that simply keeping cats out of the bedroom can make a big difference for some allergy sufferers, Viki – I’m glad that’s working for your son. I’m allergic and have 3 cats (well, 4 maybe, we just found a stray and he’s getting tests done today). I just take Zyrtec and use air purifiers. Also, I read online that sometimes people’s diets are actually the problem, but it often gets blamed on pets. Especially when it’s a newly developed allergy. My allergies have gotten better since I eliminated dairy and reduced wheat from my diet. That’s an interesting point of peoples’ diets contributing to their allergic reactions, Kathie. Makes sense to me! I am allergic and I live with 5 cats…with some medicines and immunotherapy injections, I can take control of it and stay quite well, the symptoms are very less. I have two years yet to finish the teraphy and at the end if it doesn’t work, I’ll try with some other alternative modalities like acupuncture. But my cats will stay always with me!!! Good for you for working through your allergies, Elena! I’m glad the article came at the right time for you, Raine. Let me know how things work out for you.